Value Hole (noun) – Your filthy mind could probably define this in an unlimited number of ways. In fantasy football, we use “Value Hole” to describe a seemingly open depth chart spot that should offer significant fantasy value to whoever fills it (via draft or free agency). We judge “Value Holes” by assessing the Available Usage, Surrounding Talent and Coaching Scheme surrounding the hole. Most often, the open backfields produce the most monstrous fantasy swings. However, many times serious chunks of “Aerial Pie” (open passing yards and targets), dished out by tasty QB chefs, create huge upside. 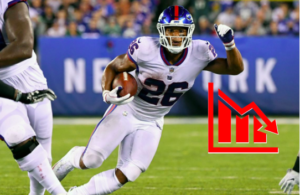 Last month, just as NFL Free Agency was kicking off, I gave you the Top 10 Value Holes we were keeping an eye on for fantasy purposes. Simply put, these are the open roster spots that checked all our boxes concerning coaching scheme, surrounding talent, and usage opportunities. Predictably, most of these openings were filled during free agency; some, however, remain open, while others have emerged as players have vacated roles on their previous teams to head elsewhere. Here are the value holes we’re currently keying in on as the next phase of the offseason, the NFL Draft, approaches later this month. Let me preface this by saying I know what happens every year: the Patriots are deemed “dead” due to the lack of weapons they have surrounding their All-World QB, and they manage to turn lemons into kale-infused lemonade and win the AFC yet again. 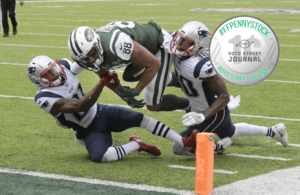 And every year we say “but this year just feels different.” Well, this year does feel different — Rob Gronkowski is gone to retirement, and after Julian Edelman and Philip Dorsett, there is no discernible receiving talent to speak of. One-year flyers on Maurice Harris and Bruce Ellington are likely irrelevant for fantasy purposes, as is Josh Gordon until he can get his life together and stay on the field. Even after signing Austin Seferian-Jenkins, basically every mock draft has New England going tight end with No. 32 overall, targeting names like Alabama’s Irv Smith or even trading up to snag Iowa’s Noah Fant or (long-shot) T.J. Hockenson. Regardless, the Patriots have a lot of holes to fill with respect to Tom Brady‘s pass-catchers. This was a top-tier value hole in our first installment, and remains one as Tampa Bay has done nothing at all to fill it. Dozens of running backs have gotten new deals but none have been with the Bucs, who still have only Peyton Barber and Ronald Jones as the “proven” guys in their backfield. They did sign Andre Ellington this offseason, who spent most of 5 seasons with Arians in Arizona, but that’s more for depth and a pass-catching role than anything else. Arians is a QB guy at his core but in general excels at building offenses, and was able to turn David Johnson into virtual cheat code during his time with the Cardinals. He could do the same for Barber or Jones as well, but neither has shown true bell-cow potential yet in their careers. Some mocks have suggested Tampa taking Alabama’s Josh Jacobs early, or even a late-round flyer on 2017 Heisman runner-up Bryce Love, who tore his ACL in his final collegiate game in December. Love claims to be “ahead of schedule” in his rehab — then again, who doesn’t — and could end up being a huge steal on the 2nd or maybe even 3rd day of the draft. The Saints lost some offensive star power when Mark Ingram left for Baltimore, but the league’s No. 3 scoring offense from 2018 will be just fine. They replaced Ingram with Latavius Murray, signed tight end Jared Cook, and still have explosive weapons like Alvin Kamara and Michael Thomas around their Hall of Fame QB. But, WR depth is where this offense begins to have some question marks. Tre’Quan Smith has shown flashes of potential, but it seems the team is hesitant to trust him as a steady 2nd receiving option behind the All-Pro Thomas. The team already knows what they’re getting with Ted Ginn, Jr. — not much — and guys like Cameron Meredith and Keith Kirkwood are still too unproven to be relied upon just yet. Unfortunately for the Saints, they have just two picks in the first five rounds, with their first coming at No. 62 overall. Some solid receiving options may be up for grabs in that area, highlighted by Ohio State’s Terry McLaurin, UMass’ Andy Isabella or Georgia’s Riley Ridley, to name a few. The Packers will look very different than what we’re used to once the 2019 season gets started. For the first time since 2006 they won’t be led by Mike McCarthy, who was fired at the end of last season and replaced by the offensive-minded Matt Lafleur. And for the first time since 2011, Aaron Rodgers won’t be completing passes to Randall Cobb, who signed with the Cowboys this offseason after spending his first 8 seasons in Green Bay. This leaves a big hole at the WR position after Davante Adams, and it’s anyone’s guess who will step up to fill it. Geronimo Allison, Equanimeous St. Brown, and Marquez Valdes-Scantling have all had roles in this offense before, but especially with recent reports about the dysfunction between Rodgers and his young receivers, it remains to be seen if any of those guys can fill Cobb’s role as well as he did. 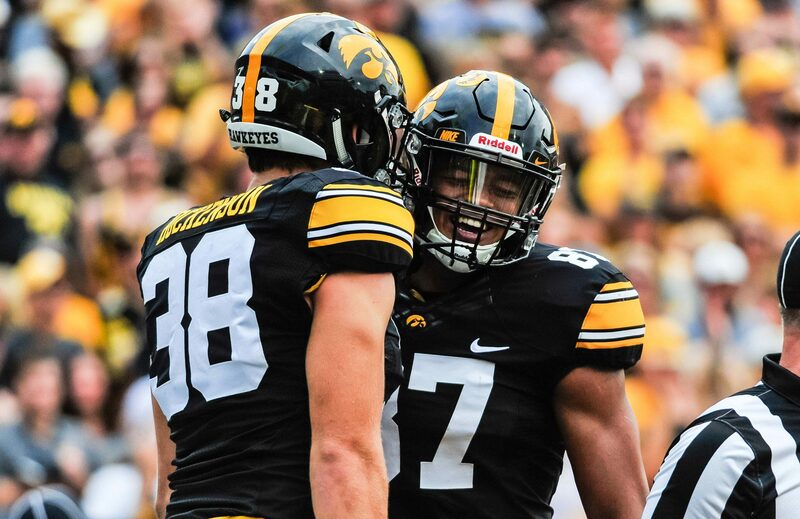 Most mock drafts have the Packers using the 12th overall pick on Iowa TE T.J. Hockenson, forming a lethal combo with Jimmy Graham at the tight end position, but they’ll also likely have access to guys like D.K. Metcalf, Marquise Brown or N’Keal Harry if they so choose. Regardless of what you think about Joe Flacco, he’s undoubtedly an improvement over the QBs the Broncos have been trotting out since Peyton Manning’s retirement. While Flacco inherits a solid backfield led by Phillip Lindsay, his group of receivers is not so strong. Emmanuel Sanders was on pace for one of the best years of his career through 12 games last season, but tore his Achilles during practice in early December and was lost for the season. With Sanders out, Denver failed to score more than 16 points in any of their final 4 games, going 0-4 and completely falling out of the playoff hunt. We saw some potential from guys like Courtland Sutton and DaeSean Hamilton throughout the season, but nowhere near enough to put a lot of trust into either. Many mocks have linked Denver to Iowa TE T.J. Hockenson, who would step in and immediately be the best tight end on the roster and a strong option in the passing game. If the Broncos go elsewhere in the first round, they could also look into some older receivers who remain unsigned, like Dez Bryant, Michael Crabtree, or old friend Demaryius Thomas. Much of the potential of Washington’s pass catchers depends on their QB situation: Colt McCoy has reportedly suffered some setbacks in his recovery from a broken leg, and the Skins went out and traded for Case Keenum as a security blanket. No matter who wins the starting job, there is a ton of production up for grabs in this offense after Jamison Crowder fled to the Jets. Jordan Reed is always productive when healthy, but after missing 17 games over the past 3 seasons, he’s hardly a reliable option for fantasy purposes. 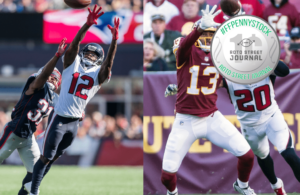 Josh Docton and Paul Richardson both showed some promise late last year, and we’ve told you what we think about Trey Quinn‘s potential as a strong penny stock, but none of that should stop the Skins from beefing up at the WR position in the draft — possibly in the form of Combine superstar D.K. Metcalf at #15 overall or NC State’s Kelvin Harmon in the 2nd or 3rd round. Shoulder surgery has put Cam Newton‘s 2019 season into question, which leaves the Panthers, like Washington, unsure of who will start the season as their quarterback. But whether it’s Newton, Taylor Heinicke, or someone not currently on the roster, someone’s going to have to catch their passes. Christian McCaffrey is basically a receiver that works out of the backfield, having led the team in receptions in his first 2 seasons and in receiving yards in 2018, and D.J Moore showed a ton of promise while playing all 16 games as a rookie. But Devin Funchess is now in Indianapolis and Greg Olsen can’t seem to stay healthy, so some depth in the pass catcher department would be a smart investment for Carolina. The team has other, more pressing needs to address early in the draft, but could make a move for someone like Ohio State’s Terry McLaurin on day three. After making big moves for Antonio Brown, Tyrell Williams, and Trent Brown this offseason, the Raiders may be on their way to a respectable season in Jon Gruden’s 2nd year. But on the negative side, standout TE Jared Cook signed with the Saints this offseason, leaving no tight ends on the roster who had more than 13 receptions last year. Cook caught 68 balls for almost 900 yards a season ago, so replacing his production from that position is important if the Raiders want to improve upon their 4-12 mark from 2018. Oakland owns 4 of the top 35 picks this year, giving them ample opportunity to make a splash and grab some young talent. They’ll likely go defensive at No. 4 overall, but picks 24, 27, and 35 could be used to grab a promising young tight end like Noah Fant out of Iowa or Bama’s Irv Smith. The Ravens were a pleasant surprise last season, winning 6 of their final 7 after Lamar Jackson took over the starting role and almost coming back to win their Wild Card Round game. They ended up with the 2nd-best rushing offense in football behind their mobile QB, top 10 offensive line, and solid backfield, and adding Mark Ingram to that mix should only propel their run game even further. But when it comes to who will be catching Jackson’s passes, the options are sparse. Last year’s leading receiver John Brown left for Buffalo, and veteran Michael Crabtree is gone as well, leaving Willie Snead as the only returning player to log over 600 receiving yards in 2018. After Snead, Baltimore’s receiving talent drops off considerably, leaving a gaping hole for the WR2 position that likely won’t be filled by the likes of Seth Roberts or Jordan Lasley. Baltimore has been linked to many receivers that should be around when they pick at #22 overall, including Oklahoma’s Marquise Brown and Ohio State’s Parris Campbell. This particular value hole could potentially be filled with guys already on the roster if they get healthy and/or improve in 2019, but it’s still worth mentioning. Especially with Super Bowl MVP Nick Foles taking over as Jacksonville’s QB and last year’s WR2 Donte Moncrief heading to Pittsburgh. I’ve already told you how much I like Dede Westbrook as a Penny Stock this year, and part of that interest comes from the lack of receiving talent on the roster besides him. Keelan Cole has to mitigate his drops to become a legitimate threat, and Marquise Lee is coming off a knee injury that kept him out of the entire 2018 season. The Jags pick a bit too early at #7 overall to consider taking one of the draft’s top receivers, but could trade down or use the 38th overall pick on someone like Marquise Brown or Kelvin Harmon to shore up their receiving corps for the present and future.